Flutist Carol Wincenc has been teaching and performing for 40 years. She started as an orchestral player and has long been known as one of America's leading solo artists. Last season she marked this 40-year milestone with a Ruby Concert Series featuring several newly commissioned works. 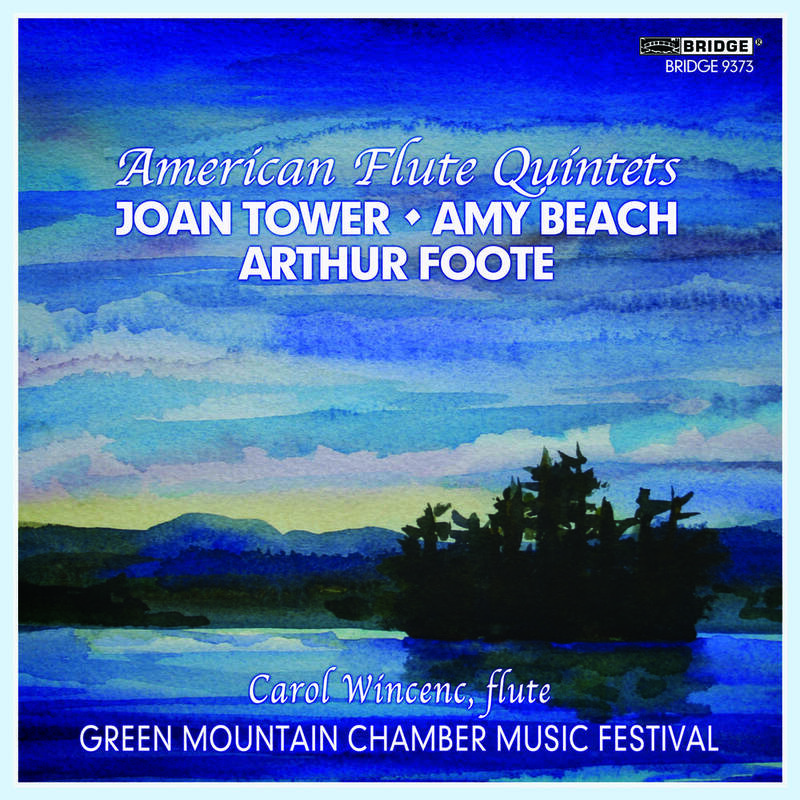 One of those pieces, titled Rising, by Joan Tower, appears on a new collection of American Flute Quintets, featuring Carol Wincenc with the Green Mountain Chamber Players. "What I love most about it, it's her use of color, and energy and rhythmic play," Wincenc says of this piece, "Whether it's through syncopation or repeating certain notes or repeating the same note — she's able to get a power, a drive that is absolutely unstoppable when it's in motion, and also it's gripping. And I plug into that." Joan Tower's piece, Rising, is a good place to hear how Wincenc applies a variety of techniques to her playing. "I think specific to the flute, specific to her writing, there's that sense of how are you going to attack a note to get a real sforzando or a subito piano after a forte. Or, in her case, what Joan loves is this sense of eye lining a note. She loves this term, eye lining, where you have to create such intensity in the timbre that it gives the sense of, oh, how do I describe it — as if it's going to erupt, and of course, with that motif of rising, rising, there's an inherent tension right as you begin the ascent." Carol's first instrument was violin. It had a bigger influence on her flute playing than she realized at the time. She studied violin with her father, who was the first concertmaster of the Buffalo Philharmonic. Years later, while teaching with one of her flute students at Juilliard she had a huge revelatory experience. "I was trying to get her to get a certain kind of staccato. And it was like a bomb went off. And I said, oh my God, I'm just imitating the violin, which you have to do for detache and staccato and different kinds of staccato on the violin. Also, I had this similar experience with vibrato and non-vibrato. I said, oh my Gosh, I'm trying to imitate the variety of open string and vibrated string. So my very first experiences with the violin absolutely dictated what I did on the flute." Each piece on this collection of American flute quintets is very tonal, very listenable, yet there are a few harmonic surprises, according to Wincenc. "Especially in the Arthur Foote Night Piece," she adds. "That's very jarring. There are moments of it being unsettling and at the same time, extraordinarily calm. When I was playing the first edit for a colleague of mine, the tears just rolled down her face and she said, 'Oh my God, you totally captured it!'" Carol Wincenc says the Theme and Variations for flute and string quartet, by Amy Beach, is a work that's well respected by string players, and she adds the combination of string quartet with flute is probably her favorite instrumental combination. The work is based on a four-part lullaby, with the flute soaring above the strings with a theme of its own. "There's no question that she must have been inspired by the Debussy Afternoon of a Faun, because she has that same chromatic descending in a very modal scale. So there's a connection there. And of course those kinds of modes, those ancient scales that were based on the Grecian modes evoke antiquity. So you're getting down to the origins of music here, tonally." Forty years after launching her career as a performer, Carol Wincenc is just as engaged as she was when she started her career in 1972 as a member of the St. Paul Chamber Orchestra. She's energized by her teaching at the Juilliard School and Stony Brook University, and by the numerous projects that allow her to serve the music, including her latest release of American Flute Quintets.